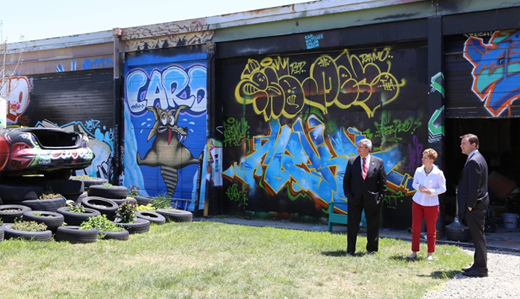 After visiting TerraCycle, a Trenton-based recycling operation, Senate Republican Leader Tom Kean and ranking Republican Environment Committeeman Christopher “Kip” Bateman introduced a resolution urging a statewide effort to keep out of landfills hazardous and hard-to-recycle materials. In a courtyard of TerraCycle’s Trenton offices, Tom Kean and Kip Bateman learn how just about everything people use can be recycled, like the car to their right and juice box pouches that were converted into outdoor furniture. Americans generated more than 3.4 million tons of electronic waste in 2012, recycling just 29% — that’s more than 142,000 computers and 416,000 mobile devices per day, according to the EPA’s most-recent available statistics. That same year, New Jerseyans only recycled about half of the more than 20 million tons of solid waste that they generated, contributing to the growing threat of land and air pollution plaguing this state today. More than 32 percent of municipal waste in New Jersey comes from packaging, as many facilities do not have the infrastructure to recycle unidentified, blended plastic bags such as common snack, chips and sandwich bags we pack for lunch every day, according to the Association of New Jersey Recyclers.